We’re sure you’ve heard some form of the popular saying, ‘running like a well-oiled machine’? This cannot be truer when it comes to oil and your car. Simply put, if you don’t have oil then you’re car isn’t going to make it from point a to b. We all know that engine oil is needed to keep your vehicles’ engine ticking over smoothly. But did you know that an oil filter is a crucial component in this lubrication system? As oil moves through your engine, it picks of debris, particles of metal and other contaminants. Over time, the oil will get more and more dirtier, and begin to lose its ability to clean and lubricate your engine, eventually causing permanent damage. Hence, you need an oil filter to clean this oil and get your car purring like it was brand new. 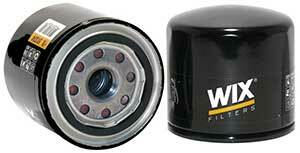 Many manufacturers recommend getting a new oil filter every time you change your oil. This can be anywhere from 3,000 to over 15,000 miles. That’s a lot of miles, so it makes sense to get the best oil filter possible. The problem is, not all oil filters are created equal… some will do a better job and do that job for longer. Determining the best oil filter for your vehicle whether that be a car or truck, motorcycle or auto-racer, is no small feat. That’s why we’ve done the hard work for you and have reviewed dozens of models to bring you the top ten best oil filters for 2019. Royal Purple is an American manufacturer specializing in lubricants for many different types of vehicles. They’ve been around since 1986, which is pretty short compared to some of the other big players out there. Despite this; they’ve developed a large and loyal fan-base thanks to their high quality products. In the extended life oil filter, Royal Purple have shown why they continue to be one of the leading manufacturers when it comes to all things auto-care. Let’s get down to the important thing – the numbers. This filter provides 99% efficiency at 25 microns thanks to the 100% synthetic micro-glass media. The synthetic fibers are extremely compact and fine, preventing almost all contaminants from getting through. You can be assured that the dirty oil entering the filter is coming out clean and ready to service your engine. All components ooze quality. A nitrile rubber base gasket is used to prevent leaks as well as a silicone anti-drain back valve to prevent dry starts. The end caps, centre tube and bypass valve are all metal and will provide a lifespan comfortably over 10,000 miles. It’s an impressive number and makes the relatively high cost of this filter well worth it. The shell housing the filtration system is extra thick as well, which will keep the internal components safe from things like road debris. When it’s all said and done, it’s pretty hard to figure out what truly is the best oil filter. There are just so many variables. If you were to ask 5 people which one they prefer, you’d end up getting 5 different answers. However; based on all our research and from speaking to customers who’ve purchased this filter, all signs point to a product that may well be the best of its category. We wouldn’t blame you for going with something else a little down this list but we will blame you if you don’t at least consider this excellent oil filter from Royal Purple. Purolator – ‘pure oil later’ – have been around for over 90 years and provide some of the very best oil filters you can get your hands on. We’ll tell you why. It all begins with a high density synthetic blend media that results in 99% + efficiency and up to 10,000 miles of usage when used with full synthetic oil. Generally, an oil and filter change is typically recommended every 5,000 miles, so using this oil filter will save you a decent amount of coin over the long-term. Purolator have provided a ton of value considering the modest asking price. All components are built with premium materials including a silicone anti-drain back valve, metal bypass valve and metal center tube and end caps. In short, if there is one oil filter that can withstand the rigors of day to day use, this is it. Keep in mind that due to the high density of the media, the maximum oil flow rate will take a hit. The filter will still work perfectly well for most vehicles in most situations, but we’d advise to go with another filter that is specifically designed for high performance engines if that’s your specific need. It’s also worth noting that the media is not wire backed which is supposed to help maintain structural integrity. As it turns out, the wire backing isn’t needed since synthetic blend media is a lot easier to mold and more stable then its more advanced synthetic counterpart. Overall, the PurolatorOne is very well received by its customers and provides the best bang for your buck. Whilst it may not be the number 1 choice for high performance vehicles, if you are looking for something reliable, durable and affordable, then you should definitely have this filter on your wish list. 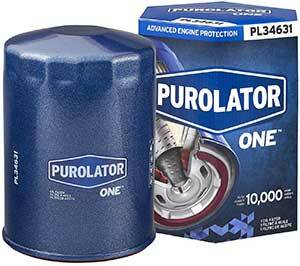 Purolator also offer 2 other lines of oil filters, the Purolator Classic and the PurolatorBoss. The Purolator Classic is an entry class filter and a couple of dollars cheaper. You’ll get at least 5000 miles out of it but keep in mind that the construction isn’t as good as the PurolatorOne. It uses a rubber anti-drain back valve and cellulose media which results in a lower 96.5% efficiency. Purolator’s most premium model, the PurolatorBoss is similar to the PurolatorOne but features a more durable design. It’s also almost double the price. You can expect at least 15,000 miles of use at 99% efficiency. The media is also fully synthetic with a premium silicone anti-drain back valve and full metal construction. Considering the prices of all three, it’s a no brainer that the PurolatorOne offers the best value for money. For most customers, the difference in performance between the PurolatorOne and PurolatorBoss will be negligible. However; if you demand the very best of the best, than the PurolatorBoss will be right up your alley. Since 1972, AMSOIL have been a leading producer of synthetic lubricants and filters. 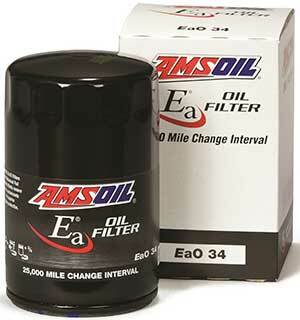 Every industry has a premium standard, and when it comes to oil filters, AMSOIL is it. We wouldn’t expect AMSOIL to use anything but the very best materials when it comes to their oil filters. They’ve used metal and silicone components as well as a wire backed synthetic media which offers an amazing 98.7% filtration efficiency at 20 microns. If you need your oil squeaky clean, than this is the right filter for you. You’ll be able to use this thing for at least 15,000 miles or 1 year (whichever comes first) before needing a change. Even more so, if you decide to get the other type of filter which is designated with the product code EaO, then you can expect this number to be pushed up to 25,000 miles. However; this is only guaranteed if you use AMSOIL synthetic oils. You may be wondering why this filter isn’t out top pick? 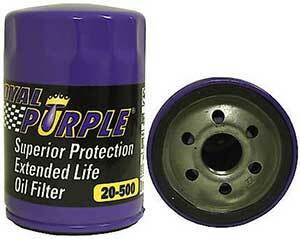 Well, it’s basically the same as the Royal Purplse extended life oil filter which we’ve ranked as number 1. The only difference is that the AMSOIL filters cost more and don’t sport a fancy purple paint job. Take a look at this video if you don’t believe us. If you need further proof, they are also both made by Champion Labs. If we had to choose one over the other, we’d go for Royal Purple’s filter as you’ll save some money. Having said that, if you’re already a loyal fan of AMSOIL’s products then we wouldn’t blame you for going with this filter – after all, it’s still a fantastic product. We don’t think a list about the best oil filters could ever be complete without the mention of at least a couple of German brands. After all, we all know that German engineering is considered a class above the rest. Bosch have been around since the 19th century and are the world’s largest supplier of automotive components. When it comes to motor oil filters, they sure know what they are doing. What makes their Premium FILTECH oil filter stand above the rest is the whooping 99.9% filtration efficiency. Particles as small as 20 microns will get caught in the cellulose and glass blended media. 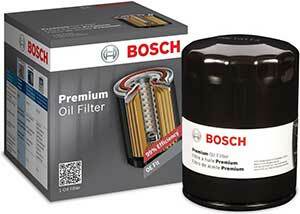 Bosch have followed the trend of ‘bigger is better’ and feature a media with 42% larger area and 30% thicker than other similar oil filters. Even though the blended media isn’t as high performing as a full synthetic media, the extra surface area (71 square inches to be exact) ensures industry leading filtration efficiency. The larger media results in about a 14 gram capacity. It’s more than enough, but about half that of Mobil 1 extended performance oil filters. Build quality is top notch. There is a silicone anti-drain back valve and metal bypass spring. Unlike other models where the bypass spring is something that can be detached, Bosch have decided to build the spring into the end cap. At this price point, it’s a very nice touch and will greatly increase durability and performance. The gasket design is also worth mentioning as it’s pre-lubricated to ensure a tight and easy fit to the engine. This oil filter is a fantastic pick for the price and features an all-round premium construction and high end filtration ability. It’s a top quality product that should be on your radar. If you’re budget conscious, then you can’t really go wrong with choosing an oil filter from Bosch or the previously mentioned Purolator PureOne oil filter. Almost everyone has heard of Mobil. They are a powerhouse in the American oil industry and have been around for over a century. When it comes to all things oil, Mobil is the company many people turn to. 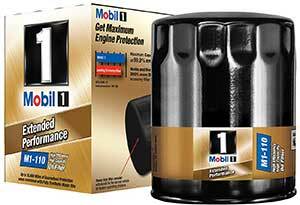 In comes the Mobil 1 extended performance oil filter and it’s no surprise that this is one of the top sellers. The filter sports a 99.6 efficiency at 25 microns thanks to the synthetic media material. Perhaps the most impressive feat is the class leading media capacity which can hold up to a staggering 28 grams of contaminants – double that of many competing products. Mobil have stated that this filter should last 15,000 miles (with synthetic oil) before a change, and with that sort of capacity we don’t doubt them. On top of this, you also get a premium silicone anti-drain back valve which prevents oil from pouring back into the filter when the engine stops. This ensures no dry starts since you’ll always have oil in the engine. There is also a metal bypass valve which is activated if the medium is clogged and can’t provide adequate flow rate to the engine. It’s a common safety you’ll find in almost any filter. Lastly, this unit can withstand up to nine times the usual operating pressure. In numbers, this equates to 615 Pascals per square inch which is higher than pretty much any other filter out there. Why is this important? Well, pressure changes depending on the strain on your engine. If you’re travelling at high speeds in hot weather for example, your engine will need more oil resulting in higher pressure. This fact makes Mobil 1’s oil filter perfect for high performance engines that demand a high oil flow rate. There are two nit-picks worth mentioning however. The first is that you can expect to pay a couple of dollars more over similar brands. The second is that the media does not have a wired back. You’ll commonly find a wired back in other premium oil filters to provide extra stability to the whole structure. Why Mobil didn’t include this in the design is beyond us. Despite these niggling drawbacks, you’ll find a powerful and premium oil filter here. Mobil 1 have provided a massive line-up of oil filters, covering 97% of vehicles in operation today, so you’ll have no issue choosing the right size for you. Whatever vehicle you have, there will be a Mobile 1 oil filter for you. Overall, this oil filter comes with our recommendation. It is constructed to a very high standard and offers class leading capacity. If you require a filter that can withstand the pressures of a high performance engine, this is it. Tip: When installing a filter onto your vehicles engine, it’s handy to dab a bit of motor oil on the gasket. This helps make a better seal and will also make the filter easier to remove. WIX are a well known brand with a specific focus on oil, air and fuel filters. If you need some sort of filter for you car, the boys at WIX probably have something for you. When it comes to oil filters, they offer 3 types for drivers of regular and light trucks. The one that stands out the most and provides the best value for money is the WIX spin-on lube filter. It’s built with a nitrile sealing gasket that is hydrogenated to improve durability in high temperatures. Other premium features include a steel baseplate, metal end caps and metal center tube. The bypass material is also a coiled spring as opposed to something like plastic. Lastly, the anti-drain back valve is made from silicone which is far more durable than rubber, and will do a better job at keeping its form under extremely low or high temperatures. The construction is excellent, but the media is also premium quality. It’s made from a synthetic material with an area of 55.5 square inches and provides an efficiency of 99% or more for most particle sizes. Oh, and one more thing, it’s also wired backed which is a sort of ‘scaffolding’ that helps keep the whole thing together. Keep in mind that this filter does have a fairly odd shape which may demand a specific wrench. However; once screwed on the gasket will do its job and firmly keep it attached to your vehicle. WIX is a favorite for vehicles with long idle times and lots of highway driving. Think trucking across the country. It makes sense that it is built with the highest quality components to give you the assurance that you won’t be stranded somewhere in no-man’s land. It’s a reliable brand and you can’t do wrong by investing in one of their oil filters. For those looking for something with an even more durable design, you can take a look at the WIX XP spin-on lube filter. It’s better suited if you use your vehicle for trucking or towing or you typically drive in extreme temperatures. Simply put, if you’re vehicle is used for things that does not involve typical commuting, the XP filter is a good choice. The Motorcraft oil filter is the OEM (Original Equipment Manufacturer) for Ford, Lincoln and Mercury model cars. It’s trusted by these popular brands and by the people who drive them. The reason is simple – this is an affordable, well made and reliable oil filter. Starting from the construction, the filter features a steel, ‘ironed’ case. Basically, it is thinner where it should be and makes for a more solid fit over some of the other filters out there. It’s also painted to help prevent rust build up and corrosion. The fluted case end design will ensure an easy removal when you’re performing a filter or oil change. If you’ve been hanging around oil filter forums like we have, you’ll notice something unique with Motorcraft oil filters – they have a threaded (as opposed to the typical dome) end bypass valve. In the rare event that the media becomes clogged, a bypass valve will come into effect to ensure continual oil flow. The threaded valve in theory should do a better job in preventing dirt in the media from entering the oil flow, thereby minimizing any damage to your engine. For some, this feature is enough to choose a Motorcraft oil filter over any other. However; since a clogging event is so rare, most manufacturers don’t build such a valve and the majority of consumers simply don’t care for such a feature. When it comes to pure filter ability though, this filter falls short with an efficiency of 93% due to the cellulose media. On top of this, a capacity of 12 grams is very respectable but still significantly less than some other brands like Mobil 1. 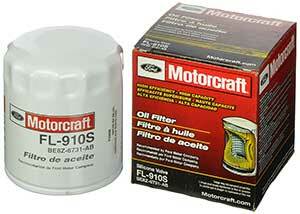 Despite the somewhat lackluster filtration, Motorocraft oil filters are some of the most affordable on the market. Considering the quality brand label and build, we highly recommend this product for fans of Motorcraft and those looking to save some money. The K & N Pro Series oil filters are designed for high performance vehicles that demand a high oil flow rate. Everything about this oil filter is designed for engines that need a lot of oil – think of racing and trucking. K & N have opted for an impregnated cellulose media. Whilst this does not offer a filtration capacity as high as fully synthetic media, it is found to allow a higher flow rate for heavier oils typically used in racing. Rest assured you can still expect a filtration efficiency of 99% for most particle sizes thanks to the large 94 square inches of media surface area. K & N have even designed their filter for high speed situations. You’ll find a 1 inch nut on one of the end caps which ensures an easy fit. The nut also contains a hole where you can fit a safety wire that will ensure the filter stays put during bumps. When it comes to the construction materials, there is a silicone anti-drain back valve and a spring metal bypass valve. The end caps and center tube are also metal. These are premium materials and will outperform similar oil filters that use plastic and cardboard for their components. K & N have decided to skip on reinforcing their media with a wire backing though. It has been speculated by some that a wire back may actually reduce the flow rate. We’ll never truly know why K & N opted out of using such a feature but it doesn’t deter from an impressive oil filter. Overall, this oil filter has been specifically built for high performance engines and you’d be doing yourself a disservice for not considering it if you drive a vehicle that requires a high oil flow rate. The filter will accommodate and perform well on blended or conventional oil, though we doubt you’ll be using it with anything but synthetic oil. 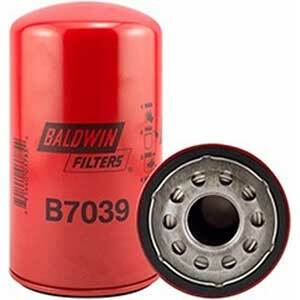 Baldwin is known to produce some of the most heavy duty oil filters in the world. So much so that the Baldwin heavy duty lube spin-on filter is a favorite amongst trucking circles. It features a robust spring loaded metal bypass valve which allows oil to continue to pass through the filter when it has reached capacity. After all, dirty oil is better than no oil right? When you’re dealing with an expensive engine as is common in trucks or larger vehicles, the last thing you want is a dry engine. Apart from this, you get the standard components like a nitrile rubber anti-drain back valve and steel end cap. Interestingly, the media has 44 pleats. This is pretty average amongst many oil filters and we can probably guess it allows the oil to have a high flow rate which meets the demands of larger engines, like those found in trucks. In terms of cleaning efficiency, numbers are pretty hard to come by as Baldwin doesn’t provide these figures on their website. From our research, it looks like you can expect an average efficiency of 85.44% between 12 and 30 microns, which is below many of the oil filters out there. Despite this, Baldwin remains a favorite amongst many customers, but especially truckers. It’s a highly durable design which will withstand the rigors of any terrain and environment. And hey, the bold red paint job is a pretty nice touch as well. ACDelco have been around for over 100 years and are owned by General Motors. You’ll find automotive brands like Chevrolet, Buick, GMC and Cadillac all sporting ACDelco factory parts. 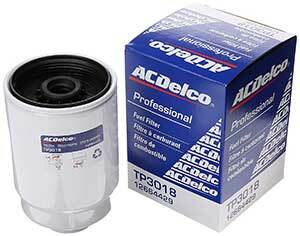 In the ACDelco professional fuel filter, we have a capable unit that is built to last. The filtration media is a wired-backed cellulose and has a 98% filtration efficiency at 25-30 microns. Pretty impressive. Truth be told, cellulose media isn’t as good as a synthetic material, but it’s also a lot cheaper. Overall, you’ll be paying a lower price for something that shows little practical difference. However; if filtration efficiency is a priority to you, you’re better of looking further up this list at one of the filters that use a synthetic media. Filtration aside, the most impressive thing about this product is the quality build. It features metal end caps and center tube as well as a silicone anti-drain back valve. A thermosetting adhesive seal inside the filter casing holds the filter media in a permanent position once the temperatures rises to a certain level. This effectively increases durability and results in an oil filter that has a burst strength 5 times greater than many engine oil operating pressures. You can rest assured that pressure spikes caused by thicker engine oil or due to hot or cold weather won’t pose any issues. It’s a super durable design and you can expect to get at least 12,000 miles which is covered by the warranty. Considering the relatively low price, it’s a great incentive for those of you who are sitting on the fence. Now that we’ve listed our picks for the top ten oil filters, let’s take a look at the things you should look out for before buying your next one. What makes a good oil filter? Media: This is the paper looking bit of the filter that works to clean your vehicles oil and remove contaminants. There are three types – cellulose, synthetic and a blend of both. Generally synthetic media (can be made from nylon, glass or polyester) is the most efficient because the fibers can be manufactured at a much smaller scale than the large plant based fibers of cellulose. The fibers are tightly ‘criss-crossed’ and can pick up smaller dirt particles, whilst allowing for higher oil flow rates and greater capacity and durability. Seems all good right? Well the only downside is that synthetic media is more expensive to make and will bump up the price of an oil filter. Plant based cellulose media is inferior to synthetic media in many aspects, but it is also cheaper and can still be manufactured to a high filtration efficiency. It’s a good option to put into inexpensive oil filters. It also has some innate advantages like performing better when used with heavy oils and keeping its form during high pressure oil flow. Lastly, a blend of both cellulose and synthetic hits the sweet spot in terms of price and performance. Many manufacturers are turning towards this type of media to keep the costs down whilst offering high filtration efficiency and general performance. 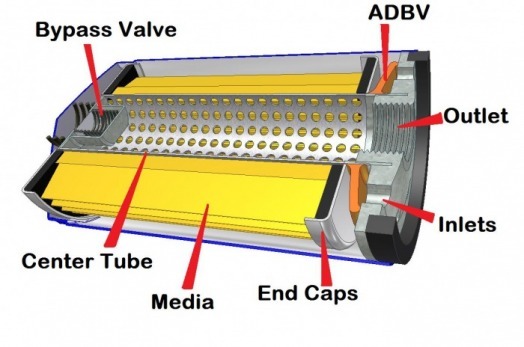 The media type, its surface area and how many pleats it has helps determine the filtration efficiency of an oil filter. Warning! Many oil filters will show a filtration at a certain micron level which can be misleading. So for example, a filtration of 99% at 50 microns is much worse then 99% at 20 microns. Then there are other factors like nominal and absolute ratings as well as the various test methods employed by manufacturers. Suffice to say, it is very hard to find the true ability of an oil filters filtration efficiency. But don’t worry; the oil filters we’ve listed are generally considered the best the industry has to offer and have universally very high filtration ratings as well. Capacity: An oil filters capacity is its ability to hold the contaminants from the oil that passes through and is determined by the build and type of media. Theoretically, a larger capacity means a longer mileage change interval. If capacity is reached, then the bypass valve will come into effect to allow unfiltered oil to continue to pass through. 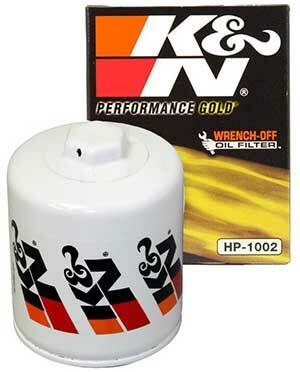 Virtually all oil filters offer more than enough capacity (at least 10 grams). As long as you follow the recommended filter changes you shouldn’t have any issues. Oil Filter Construction: A good oil filter is made of metal end caps and center tube. You’ll find cheaper oil filter to make these components out of plastic or even cardboard. The bypass valve is a component which activates when the capacity of the filter is exceeded. It allows oil (not filtered) to continue passing through to the engine. You usually want this to be made from stamped steel or a metal spring. This is far more durable than something made from plastic. The anti-drain back valve works to prevent oil from draining back into the oil filter when the vehicles engine is off. This feature prevents dry starts. The anti-drain back valve should be silicone as opposed to rubber. Silicone is superior because it can better hold its structure under very low or high temperatures. Lastly, some oil filters feature a wire backing for their media. This is sort of like ‘scaffolding’ and holds the media in place. You’ll usually find this accompanying synthetic or blended media which cannot be treated and molded as easy as cellulose media. These materials are what you can expect in a high quality oil filter. Rest assured that the oil filters we’ve featured in our top ten list are all built with premium materials. When is it a good idea to buy an oil filter? In many cases, it’s good enough to use whatever oil filter came with your vehicle. However; if you are looking to squeeze the most performance (and mileage) out of your car, then buying a premium oil filter is the way to go. This goes hand in hand with also using a premium fully synthetic motor oil. Synthetic motor oil lasts a lot longer than conventional motor oil, so it makes sense to get an oil filter that will last just as long. That way, you can easily get at least 10,000 – 15,000 miles of use before changing the oil or the filter. It may be a bit more expensive upfront, but you’ll help minimize potential engine problems in the future. Of course; buying a good oil filter is also recommended if your vehicle is used for specific purposes like auto-racing, trucking or off-road driving. Oil filters come in different shapes and sizes and must be sized correctly before being attached to your vehicles’ engine. Luckily their are online resources you can use to help you find a compatible filter. Go to the oil filter section of the Autozone website. Select the year, make, model and engine of your vehicle and then hit ‘Add Vehicle’. You should see a screen listing the compatible oil filters. Take a note of the brand and part number that you are interested in purchasing. At this point, it’s a good idea to take a look at our top ten list to figure out which brand is best for you. Select the brand from our list and you’ll be taken to Amazon. Now you just need to find the filter with the correct part number. Another option is called ‘My Garage’ from Amazon which allows you to load up your cars data and let Amazon decide if the product is compatible or not. It’s a good idea to use this as a double check. Well that concludes our article dedicated to finding the best oil filters for 2019. We hope you enjoyed reading it. More importantly, we hope that it has pushed you in the right direction in finding that perfect oil filter. Have any questions or comments? Leave one below and we’ll get back to you as soon as possible! I like to think of myself as a D.I.Y enthusiast. I enjoy tinkering with things both inside and outside the house. I love to help other people with their home improvement projects by sharing my experiences through reviews and guides. Copyright © 2019 · YOURBESTPICKS.COM, ALL RIGHTS RESERVED .